This recipe epitomizes two things I have been dying to try. A coffee rub and pork belly. I never need another excuse to make tacos. Where this recipe roasts the pork in the oven at 400F I plan on roasting on my grill with some maple wood chips to add additional flavor. 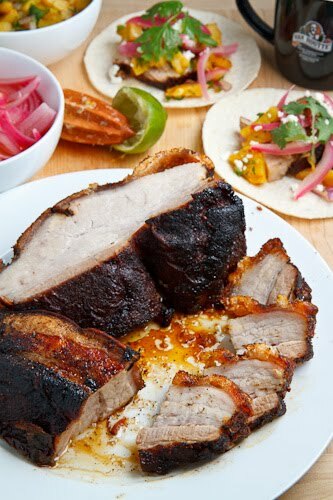 How will you prepare these amazing looking Coffee Rubbed Pork Belly Tacos? The other weekend I had the pleasure of attending an Old Montreal getaway along with Karen of Tiny Bites, Mijune Follow Me Foodie, Jody of Mommy Moment, Jeannette Everyone Likes Sandwiches and of Tanis Redneck Mommythat was put on by Van Houtte. The weekend was filled with LOTS of good coffee and tasty food including a 14 course meal with a coffee theme at Saint-Urbain. All of the coffee inspire food got me to thinking that I do not use coffee as an ingredient when cooking nearly often enough. The timing could not have been better as I was just itching to make some coffee rubbed pork belly tacos that were inspired by a sandwich that made an appearance at the first Toronto Underground Market. Pork belly is another ingredient that I do not use nearly often enough which is really a shame as it is so good and pretty inexpensive! It is a fattier cut of meat but when you slowly roast it a lot of that fat renders out and it helps to ensure that the meat is still nice and moist and tender and just full of flavour. For the coffee rubbed pork belly I went with a rub that focused in the coffee and then I built up some of the Mexican flavours with a few kinds of chilie powders, some cumin, coriander and oregano. I made sure to get my pork belly with the skin still on and I roasted at a high temperature for the first little while to ensure that the skin got all nice and crispy and turned into crackling. I rounded the tacos out with a grilled pineapple salsa, pickled red onions and some queso freso. 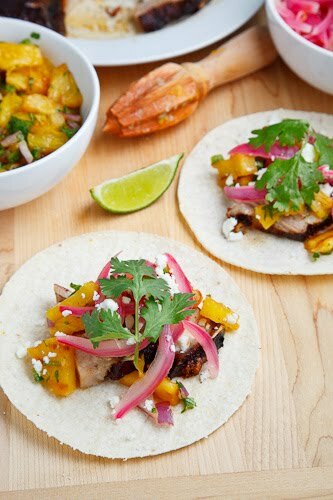 I figured that the sweet and tangy pineapple salsa and along with the pikled red onions would help balance out the richness of the pork belly and I always like to add cheese in some form to my tacos! I have to say that the coffee flavoured, super tender pork with its crispy crackling paired really well with the pineapple salsa and pickled red onions to create a truly magical flavour combination! Every time that I have used coffee as an ingredient in a recipe I have been pleased with it and I will definitely have to use it more often! Roasted pork belly is so moist, tender and full of flavour and that crispy layer of crackling is just amazing. 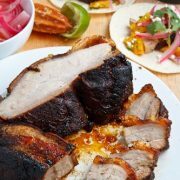 Rub the pork belly up with some Mexican spices and you have the perfect filling for some really mean tacos! Mix the coffee, chili powders, paprika, cumin, coriander, brown sugar, oregano, salt and pepper and rub it all over the pork. Place the pork into an roasting pan and roast in a preheated 400F oven for 30 minutes, reduce the heat to 350F and roast for another hour. Slice, assemble tacos and enjoy.